Arequipa is one of those places it’s easy to get stuck in. The weather is gorgeous all year round (in fact they have over 300 sunny days a year), the city is beautiful, and the food scene is blossoming. From burgers to Indian, and vegetarian sushi there are so many amazing places to eat in Arequipa. I recently spent three weeks here exploring the city and discovering all the best restaurants in Arequipa Peru. 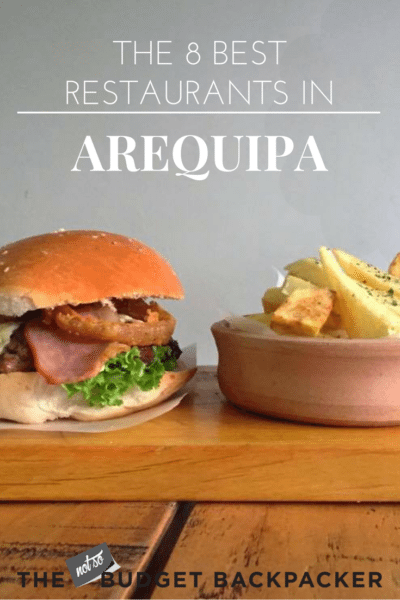 So if you’re a foodie visiting Arequipa, I’ve just made your job a heck of alot easier! The sushi in Arequipa at El Buda Profano is so good you won’t even miss the fish. With dishes including ingredients like cashew butter, pickled beetroot and tempura eggplant it’s a must-visit for any foodie on the hunt for a Vegetarian restaurant in Arequipa. The price isn’t bad too. 15 pieces of sushi will set you back 18 sole ($5.50 USD). You can even procure a decent glass of wine, which is almost unheard of when eating on a budget in Peru. Add this all together and you’ve got the best restaurant in Arequipa for sushi. Chelawasi Public House is a cool little pub serving up craft beers and amazing burgers. Head there from 4 – 6 pm for their happy hour – 10 sole beers on tap and 20 sole burgers. Chelawasi at happy hour the perfect spot for some delicious cheap eats in Arequipa My favourite was the Barbecue Burger. A classic burger served with bbq sauce, onion rings and chips with 6 types of dipping sauce. An excellent cure for a hangover washed down with a bright pale ale. They even have craft cider for those non-beer drinkers. Do yourself a favour and make sure you try Chelawasi as it’s one of the best restaurants in Arequipa. 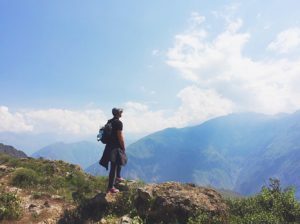 After being in Bolivia for a month I was really in need of a taste of home, which is why this list is mainly made up of gringo food. However, the traditional dishes at Ary Quepay are so good I couldn’t go past them. Head here to try Cuy (deep-fried guinea pig) if you’re game. Or for something less confronting their Rocoto Relleno (stuffed peppers served with potatoes and a creamy white sauce) is absolutely delicious, albeit a little naughty. Ary Quepay was definitely one of my favourite Arequipa restaurants. Huayruro Peruvian cafe became by daily haunt and is one of my favourite restaurants in Arequipa Peru. The coffee is top-notch and the sandwiches are even better. Treat yo-self to a chocolate frappe and a chicken, bacon and avo sandwich. Or if you’re feeling particularly naughty the teriyaki chicken sandwich served with caramelised onions and melted cheese is next level. Wondering where to eat in Arequipa? Huayruro should be on the top of your list. Chaqchao Organic Chocolates are known for their insanely good hot chocolates. Made from local cacao topped with cream and fudge sauce it’s definitely worth a visit. While you’re there you can sample the organic chocolate they make and be even more indulgent with one of their delicious brownies. With all that chocolatey goodness Chaqchao is definitely one of the best places to eat in Arequipa. Indian Cuisine Arequipa has been feeding authentic Indian food to tourists in Arequipa for almost two years now. And I have to say when researching the best restaurants in Arequipa Peru I was quite surprised when Indian was top of the list. But don’t worry this Indian restaurant in Arequipa won’t disappoint. The small 30 seater restaurant is quaint but the flavours of the food are bold and traditional. You can’t go past the creamy butter chicken or the aloo palak topped with crunchy pomegranate seeds. 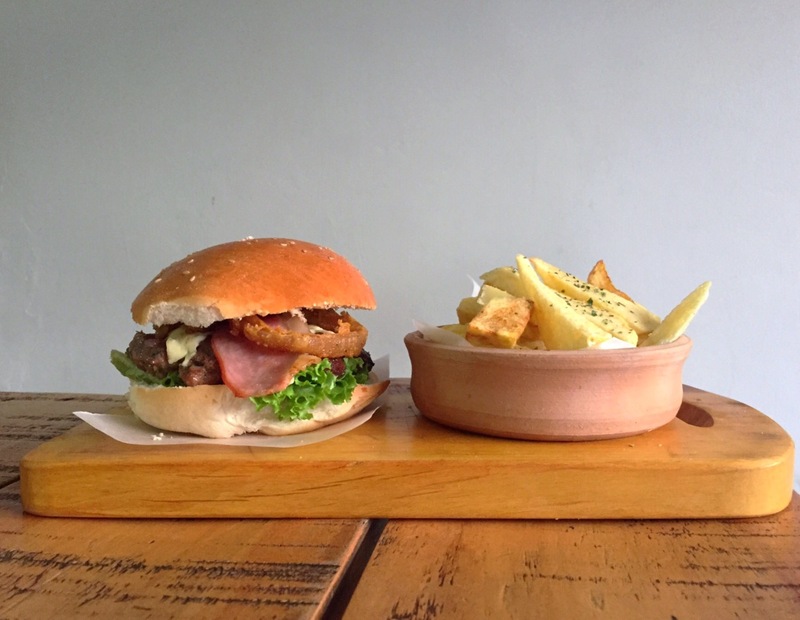 Tucked away on Bolivar street just near the Plaza de Armas is AQP burgers. 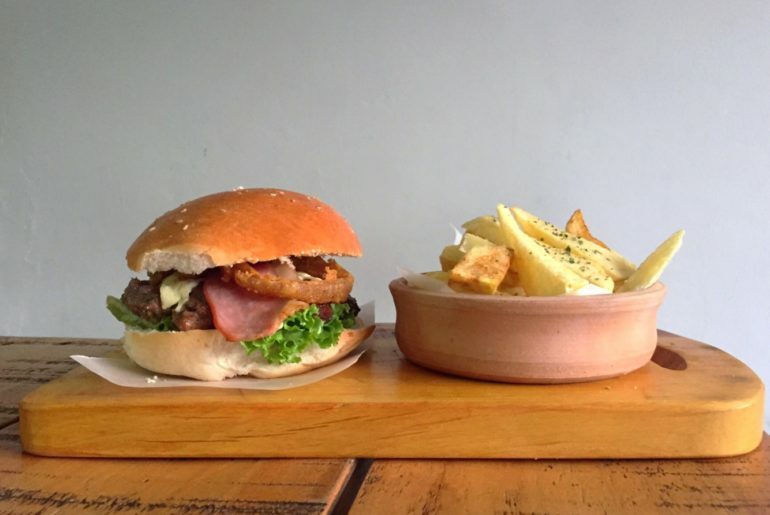 It’s one of the best restaurants in Arequipa and the best spot for cheap eats in Arequipa. 13 sole (About $3.50 USD) will get you a gourmet burger with chips and 8 dipping sauces. Again I went for the bbq burger with home-made sauce and onion rings and was not disappointed. Like the name might suggest Las Gringas restaurant and beer garden is a hot-spot for gringoes sampling the top restaurants in Arequipa Peru. With delicious wood-fired pizza and craft beers on tap, you could start any night out here. Go for the bacon and cranberry pizza on the purple base for something a bit different. This is some of the best food in Arequipa for sure! 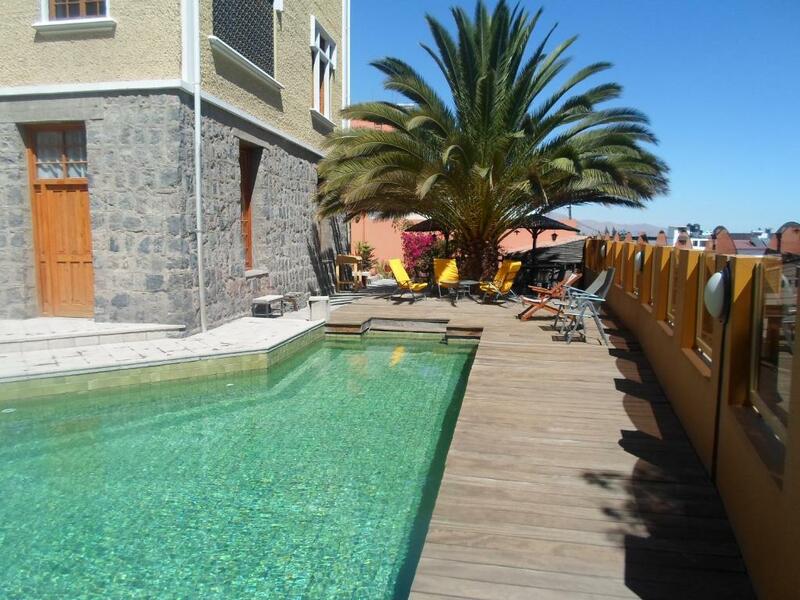 Like most places in Peru accommodation in Arequipa is super affordable. 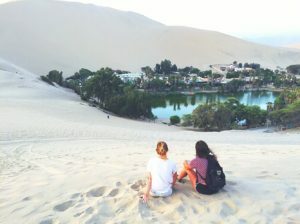 So I’ve included some a bunch of options from the best budget hostels in Arequipa to super-blinging Arequipa hotels. The 3rd of the Wild Rover chain of hostels in SA. Known for wild parties, comfy beds and good Irish tucker. 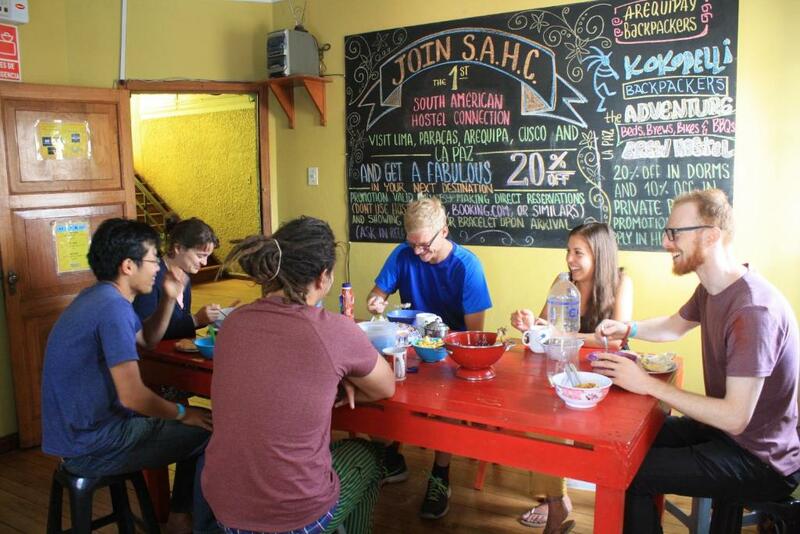 Located right in the city centre this affordable Arequipa hostel has great staff and a really social atmosphere. This boutique, yet affordable Arequipa hotel is right on the edge of town. With a stunning pool and buffet brekkie. Luxurious Arequipa hotel 15-minutes from the city centre. With an awesome pool and views of Volcano Misty. I was definitely scrimping when I was in Arequipa and managed to spend around $20 USD per day. That was by cooking most of my own meals and volunteering at a hostel for room and breakfast. 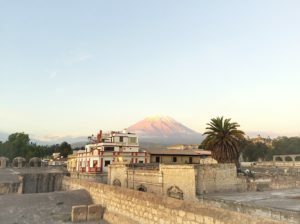 However, if you were dining out and paying for Arequipa accommodation you’d be looking at spending about $30 – $50 USD per day. The cheapest and easiest way to get to Arequipa if you’re already in Peru is to take a bus. The bus system in Peru is excellent. As it’s such a large country you’ll mostly take night buses. But booking them is really easy. Just head to the local bus station. There will be a number of booths from the different companies all selling tickets. Ask for the price as well as the type of seats they offer. If you want to be comfortable you should go for a 170-degree reclining chair (Basically a bed). As I was a solo female I would always take a solo seat in the premium section of the bus on level one. And it never cost me too much ($40 – $70 USD depending on the distance. The Arequipa bus station is a little out of town. but you can get a taxi there for about $5 USD. You can also book online with redbus.com (but the prices will be a little higher). The easiest way to get to Arequipa, if you’re short on time is to fly. Latam, Avianca, Peruvian Airlines and LC Peru all fly to Arequipa. I like to compare flights with Kiwi.com as they have a great little tool that allows you to do a radius search. Which is great for trying to find the cheapest airports to fly into near your destination. Compare flights here. All Over The Best Restaurants In Arequipa? Check These Out! Thanks a million Emma! We’ll be sharing your blog far and wide! Oh that is so fantastic to hear. Wish I was back in Arequipa for one more meal at Buda Profano!